- The most intelligent invertebrate - what can the octopus do? The diving here is spectacular - with waters jam-packed full of fish. Expect walls, reefs and wrecks at this remote location. Warm water, loads of marine life due to nutrient-rich upwellings from the Canary current, what's not to like about diving Lanzarote? I heard of a speedboat that can people from Ynabu or Duba in Saudi to Egypt (Hurghada). Do you know how can I contact them? Can you help Ned? E-mail news@scubatravel.co.uk with any advice. The most intelligent invertebrate - what can the octopus do? The octopus is believed to be the most intelligent of all invertebrates. As well as its relatively large brain, each of the octopus’ eight arms has its own rudimentary intelligence. This allows the arms to function independently. Researchers think that the octopus evolved intelligence to help it hunt and elude predators. In the wild, octopuses collect and manipulate objects. For example, octopuses have been observed arranging stones around the entrance to their dens. One octopus was captured on video using two coconut hulls as a makeshift suit of armour, holding the shells around itself and rolling along on the sea-floor like a ball. This has been construed as evidence of tool use. All octopuses can imitate their environment. The mimic octopus can also imitate other sea creatures, such as the predatory sea snake or a fish-eating sea anemone; this helps deter predators and also allows the octopus to get close to its own prey by mimicking a less dangerous creature. Laboratory experiment reveals that octopuses can recognise different patterns, open jars, and containers, and can solve fairly complex puzzles. One puzzle involved three transparent boxes that could be locked with a simple catch. Food was placed in the smallest box this was then placed inside another box, which was then shut inside the third box Some octopuses were able to unlock, open and remove the boxes until they obtained the crab. 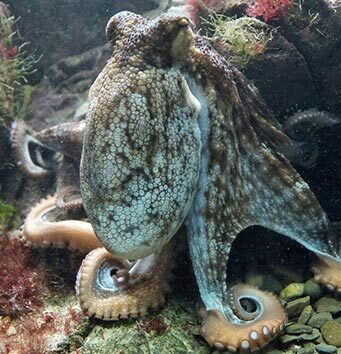 In another experiment, octopuses were able to remove the lids of childproof pill-bottles containing food items; one octopus was later observed playing with an empty bottle, moving it around her tank with jets of water. Octopuses are also reported to recognise individual humans, choosing to “shake hands” with preferred individuals while squirting ink or water at others. Maggie Martin is completing her PhD in Cell Biology and works as a lab tech for Mybiosource.com. You can follow her on Twitter @MaggieBiosource. 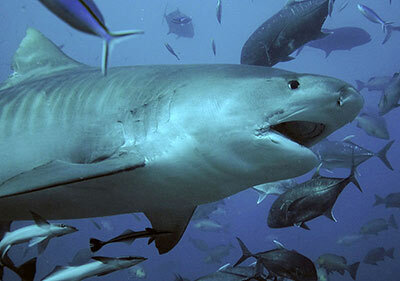 Whale sharks and slender hammerheads are nearer extinction due to human actions. Personal care products "still polluting oceans with microbeads despite company promises"
A ranking of the world's 30 largest personal care companies shows that big brands are failing to remove microplastics from their products. Decompression computers worn by recreational and commercial divers provides accurate data, study shows. Upload your data to the citizen science site. A six year study of the country's coastal waters concluded that only 350 to 500 great white sharks remain, half the level previously thought. Trophy hunting, pollution, shark nets and baited hooks are among reasons for decline. The world is eating more fish now than ever - with farmed, rather than wild-caught, animals driving the increase in recent decades. Still sustainability problem for wild-caught fish.